There continues to be mixed news on the current state of the manufacturing sector, mirroring the varied reports on the overall economy as a whole. My own sense is that manufacturing has begun to stabilize, albeit with lingering challenges that refuse to go away. On the positive side, the Institute for Supply Management’s (ISM) Manufacturing Purchasing Managers’ Index (PMI) reported that manufacturing activity grew at its fastest pace in 14 months. The composite index rose from 51.3 in May to 53.2 in June. Strong growth in new orders and production helped to boost the headline number by more than expected. Exports also improved in this report, which was encouraging given recent struggles in increasing demand abroad. More importantly, this was the fourth consecutive monthly expansion in manufacturing activity, a definite improvement following five months of contraction in the months prior to that. Yet, the ISM report highlighted some ongoing challenges. While hiring turned slightly positive in June for the first time since November, it is clear that manufacturers remain cautious enough in their outlook when it comes to adding new workers, at least for now. Inventories also continued to decline, albeit at a slower pace than in the previous release. At the same time, the two regional Federal Reserve Bank surveys—Dallas and Richmond—out last week both noted contracting activity in their respective districts in June. The Texas region has now contracted for 18 straight months as manufacturers in the district have grappled with reduced energy prices and global headwinds. With that said, respondents to both surveys remain cautiously optimistic about the next six months even with current softness in the market. In addition to those surveys, there were also other measures indicating weaknesses. For instance, private manufacturing construction spending declined once again in May, down 1.9 percent for the month and slipping to its lowest level since December. Since achieving the all-time high in September, construction activity in the manufacturing sector has ebbed somewhat, down 6.9 percent year-over-year. (The long-term trend remained positive, up 41.7 percent over the past 24 months largely on increased investments in the chemical sector.) At the same time, preliminary data suggest that the goods trade deficit widened in May to a three-month high. This was largely the result of an increase in goods imports, with goods exports slightly lower. Final data on international trade for May will be released on July 6. Meanwhile, there were also positive signals in the economy to note, in addition to the ISM data discussed earlier. Real GDP grew 1.1 percent in the first quarter, improving from the prior estimate of 0.8 percent. The revision included better data on nonresidential fixed investment and exports than previously reported, but it also found that consumer spending on services did not grow as fast as once thought either. In addition, there were indications that Americans have begun to open their pocketbooks a little, improving from the more cautious data in the first quarter. The Conference Board reported that consumer confidence rebounded in June after falling to a six-month low in May, with respondents more upbeat in their assessment of the current and future economy. Moreover, the saving rate fell to 5.3 percent, its lowest rate so far in 2016 after peaking at 6.0 percent in March. Personal spending also continued to grow modestly, up 3.6 percent year-over-year, despite slowing in May from a significant gain in April. The disappointing jobs report in May was one of the more significant factors in derailing the Federal Reserve’s plans to raise short-term interest rates at its June meeting. For their part, manufacturers lost 10,000 workers on net in May, with 35,000 fewer employees in the sector year-to-date. With that in mind, the June employment data will be closely watched for signs of a rebound on the hiring front. While the prospects of a July rate hike from the Federal Open Market Committee have now been lessened by the “Brexit” vote, a strong jobs number would likely improve the prospects for action later this year. Beyond employment figures, the other economic numbers to watch this week include the latest figures on factory orders and international trade. The Conference Board reported that consumer sentiment rebounded in June after falling to a six-month low in May. The Consumer Confidence Index rose from 92.4 in May to 98.0 in June, its highest level since September’s 102.6 reading. Americans are more upbeat in their assessments of the current (up from 113.2 to 118.3) and future (up from 78.5 to 84.5) economic environment. As such, this stands in contrast to a competing survey from the University of Michigan and Thomson Reuters, which found that consumer sentiment pulled back in June amid lingering economic anxieties. Comparatively, Americans were more optimistic in their outlook in the Conference Board report, with the percent expecting better business conditions in the next six months rising from 15.0 percent to 16.8 percent. Respondents were also more positive about expected income, with 18.2 percent feeling their incomes would rise in the coming months, the highest point since January. In contrast, the percentage predicting lower incomes dropped from 12.6 percent to 11.5 percent. To be fair, that remained higher than six months ago (9.5 percent), suggesting some worries remained on that front. In terms of the job market, 23.4 percent of respondents felt jobs were “plentiful,” down from 24.5 percent in May. At the same time, the percent stating jobs were “hard to get” also decreased from 24.5 percent to 23.3 percent. Those two measures have essentially offset one another across the past two months. The Census Bureau reported that private manufacturing construction spending declined once again in May. The value of construction put in place fell from $74.54 billion in April to $73.16 billion in May, down 1.9 percent for the month and slipping to its lowest level since December. Since achieving an all-time high of $82.15 billion in September 2015, construction activity in the manufacturing sector has ebbed somewhat. On a year-over-year basis, manufacturing construction spending has fallen 6.9 percent, down from $78.60 billion in May 2015. Yet, the longer-term trend has been positive, boosted in particular by increased investments in the chemical sector, which continues to benefit from cost advantages in the energy sector. To illustrate this growth, manufacturing construction has risen 41.7 percent over the past 24 months. As a whole, private nonresidential construction spending was also down 0.7 percent in May. The underlying data were mixed. The largest monthly decreases were in the religious (down 10.4 percent), educational (down 4.5 percent), manufacturing (down 1.9 percent) and commercial (down 1.6 percent) segments. On the other hand, there was more construction spending in May for amusement and recreation (up 3.2 percent), lodging (up 1.9 percent), transportation (up 1.7 percent) and communication (up 1.3 percent) sectors. Across the past 12 months, private nonresidential construction has increased 3.9 percent, led by large increases in office (up 22.5 percent), lodging (up 20.6 percent) and amusement and recreation (up 20.1 percent), among others. Meanwhile, private residential construction spending was unchanged in May, with 5.4 percent growth over the past 12 months. For the month, multifamily construction activity increased 1.8 percent, but this was offset by a decrease of 1.3 percent for single-family homes. Since May 2015, however, the housing market has been a bright spot, with single-family and multifamily activity up 6.3 percent and 23.9 percent, respectively. At the same time, public construction spending was down 2.3 percent in May, or 2.6 percent year-over-year. The Dallas Federal Reserve Bank reported manufacturing activity in its district has now contracted for 18 consecutive months. The composite index of general business conditions edged somewhat higher, up from -20.8 in May to -18.3 in June, but with sentiment remaining sufficiently negative for the month. Still low crude oil prices and a strong U.S. dollar continue to hamper economic growth in the region, as noted in the sample comments. Indeed, in a special question, 46.2 percent of respondents said lower energy prices have had a negative impact on their business, with one-third noting a positive impact and 20.8 percent suggesting no impact. Looking more specifically at the June data, key indicators were negative across the board, even with some of them easing a bit in this report, including new orders (up from -14.9 to -14.2), production (up from -13.1 to -7.0), shipments (up from -11.5 to -8.6), capacity utilization (up from -11.0 to -9.3), employment (down from -6.7 to -11.5) and capital expenditures (up from -6.6 to -2.1). Just more than 34 percent of respondents said new orders had declined in June, with 19.9 percent stating increased sales and 45.9 percent noting no change. Despite the challenging current environment, manufacturing leaders were cautiously optimistic about the next six months. The forward-looking composite index improved from -1.8 in May to 2.6 in June. In addition, more than 38 percent felt demand and output would rise in the coming months, with roughly half reporting no change. Similarly, one-quarter predict more hiring and 18.3 percent felt that capital expenditures would rise in the second half of this year. The Bureau of Economic Analysis reported that real GDP grew 1.1 percent in the first quarter, improving from the prior estimate of 0.8 percent. The revision included better data on nonresidential fixed investment and exports than previously reported, but it also found that consumer spending on services did not grow as fast as once thought either. Nonetheless, the bottom line was largely the same. The U.S. economy experienced relatively sluggish growth in the first quarter thanks to stagnant spending on consumer goods, declining business investment and still soft export growth, even with improvements in this latest report. Indeed, goods spending increased just 0.1 percent at the annual rate in the first quarter, with durable goods activity down 1.6 percent and nondurable goods purchases up 1.0 percent. Reduced motor vehicle sales were one of the larger factors for the decline in durable goods spending, subtracting 0.32 percent from real GDP in the quarter. At the same time, nonresidential fixed investment decreased 4.5 percent in the quarter (an improvement from the 6.2 percent decline estimated earlier) on steep declines in spending on equipment and structures. Weak inventory growth also served as a drag on real GDP for the third consecutive quarter. On the positive side, net exports and government spending increased 0.12 percent and 0.23 percent, respectively, in the first quarter, with the latter coming primarily from state and local governments. Meanwhile, the positive contribution from net exports ended two straight quarters of declines, and it represented a shift from a drag on real GDP growth of 0.21 percentage points in the prior estimate. Goods exports rose 1.1 percent at the annual rate for the quarter, whereas goods imports declined 1.3 percent. Yet, despite this progress, firms continue to struggle in their attempts to grow international demand, with first quarter activity increasing at a lower-than-desired pace. Moving forward, we would expect second quarter real GDP growth to be around 2.5 percent, with the U.S. economy expanding by roughly 2.0 percent for 2016 as a whole. Preliminary data from the Census Bureau suggest that the goods trade deficit widened in May to a three-month high. The balance of goods traded increased from $57.53 billion in April to $60.59 billion in May. This was largely the result of an increase in goods imports, up from $176.82 billion to $179.63 billion, with goods exports slightly lower, down from $119.29 billion to $119.04 billion. The goods exports data were mixed. On the positive side, exports were higher for other goods (up $535 million), foods, feeds and beverages (up $492 million) and consumer goods (up $228 million). In contrast, capital goods (down $958 million), automotive vehicles (down $369 million) and industrial supplies (down $178 million) each experienced reduced exports for the month. At the same time, the largest gains in goods imports came from industrial supplies (up $1.86 billion), consumer goods (up $790 million), other goods (up $465 million) and automotive vehicles (up $255 million). Final data on international trade for February will be released July 6. Note that the U.S. trade deficit is also assisted by a surplus in service-sector activity, which was $21.37 billion in April. The overall trade deficit was $37.44 billion in April. The final data will also include breakouts for petroleum trade and data on U.S.-manufactured goods exports. 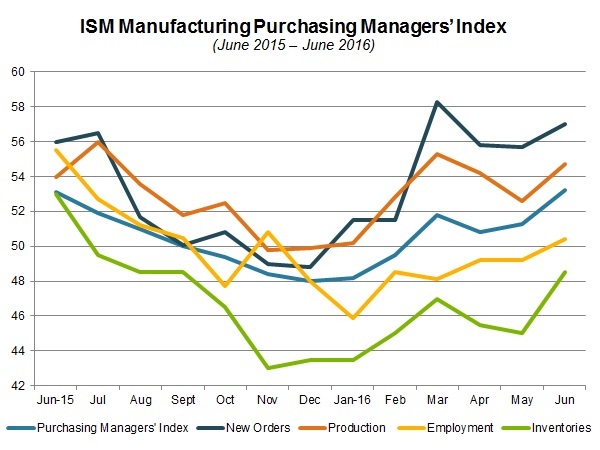 The ISM’s Manufacturing PMI reported that manufacturing activity grew at its fastest pace in 14 months. The composite index rose from 51.3 in May to 53.2 in June. Strong growth in new orders (up from 55.7 to 57.0) and production (up from 52.6 to 54.7) helped to boost the headline number by more than expected. Notably, exports (up from 52.5 to 53.5) also improved in this report, which was encouraging given recent struggles in increasing demand abroad. More importantly, this was the fourth consecutive month with manufacturing activity expanding, signaling some stabilization in the sector after five months in contraction in the months prior to that. To be fair, this does not mean that the sector has emerged completely from its challenges, and the data continue to show that. While hiring (up from 49.2 to 50.4) turned slightly positive in June for the first time since November, it is clear manufacturers remain cautious in their outlook when it comes to adding new workers, at least for now. With continued progress, we would expect for firms to begin to add to their workforces moving forward, but that has not happened yet. Look for better job growth in the months to come, particularly if manufacturers are truly seeing better demand and production growth. Inventories (up from 45.0 to 48.5) were also negative for the 12th straight month, albeit at a slower pace of decline in this release. The silver lining is that this could provide a stimulative effect for growth in the coming months, as manufacturers will need to increase production to meet additional demand, with stockpiles quite low. Input prices (down from 63.5 to 60.5) eased a bit in June but remained elevated. The recent gains in pricing pressures for raw materials have stemmed largely from higher commodity prices, including energy costs. Nonetheless, even with the pickup in raw material costs, manufacturers have largely benefited from reduced pricing pressures over the past year or so. Overall, core inflation remains modest and under control, at least for now. The Bureau of Economic Analysis reported that personal income grew 0.2 percent in May, slowing a bit from the strong gain of 0.5 percent in April. Yet, personal incomes have grown 4.0 percent over the past 12 months. This continued to be a relatively decent year-over-year pace, albeit one that was down from 4.6 percent in March and 4.4 percent in April. At the same time, total manufacturing wages and salaries edged up slightly from $835.4 billion in April to $838.3 billion in May. This continues a steady increase over the longer-term trend, up from the $780.9 billion and $804.9 billion averages of 2014 and 2015, respectively. Meanwhile, personal spending also eased, with the growth rate down from 1.1 percent in April to 0.4 percent in May. To be fair, the April jump in personal spending followed a stagnant March, making the April data something of an outlier. On a year-over-year basis, personal spending rose 3.6 percent, a modest pace that was marginally better than the 3.5 percent average over the past 12 months. In the May data, durable and nondurable goods spending increased 0.3 percent and 0.6 percent, respectively. The saving rate fell from 5.4 percent to 5.3 percent. This was its lowest rate so far in 2016 after peaking at 6.0 percent in March, and as such, it could suggest that Americans have begun to open their pocketbooks after being more cautious earlier in the year. In other news, the personal consumption expenditure (PCE) deflator rose 0.2 percent in May, growing for the third straight month. The increases from March through May stemmed largely from higher energy costs, which were up 1.4 percent in this report. Core inflation, which excludes food and energy, also increased 0.2 percent. The bottom line for this data point—which happens to be the preferred measure of inflation for the Federal Reserve—is that pricing pressures remain minimal for now. The PCE increased 0.9 percent year-over-year in May, down from 1.1 percent in April, and core inflation increased 1.6 percent over the past 12 months. The Richmond Federal Reserve Bank reported that manufacturing activity in its district continued to decline in June, falling for the second straight month. The composite index of general business activity decreased from -1 in May to -7 in June, its lowest reading since January 2013. The underlying data reflected continuing weaknesses across the board, even with some easing in the pace of decline for shipments (up from -8 to -3). New orders (down from 0 to -14), the backlog of orders (down from -13 to -17), capacity utilization (down from -6 to -10), the average workweek (down from 6 to -4) and hiring (down from 4 to -1) each contracted for the month. It is notable that this report reflected renewed softness in the labor market in June, which had notched some stabilization in May. Respondents continued to be somewhat optimistic about activity for the second half of the year, despite the more downbeat assessments currently. New orders (down from 20 to 13), shipments (down from 24 to 9), capacity utilization (down from 11 to 2) and capital expenditures (up from 10 to 14) were expected to increase on net over the next six months, albeit at a slower pace for all but the latter. With that said, employment levels (down from 2 to -1) and the average workweek (down from 3 to -8) were both seen declining moving forward. That was the first negative reading for the forward-looking hiring index since February 2010. As such, manufacturers in the region remained quite cautious regarding their hiring plans. Meanwhile, inflationary pressures continued to be quite minimal. Manufacturers in the district said that prices paid for raw materials grew 1.25 percent at the annual rate in June, edging down from 1.27 percent in May. Moving forward, raw material prices are expected to continue to grow modestly, increasing 1.38 percent at the annual rate six months from now, down from 1.47 percent in the previous report.